I was a volunteer in Bolivia with Up Close Bolivia. My experience. What is it like to volunteer in Bolivia with Up Close Bolivia? The following is an interview with Rachel Howard, aged 25 and from the UK and Noah Thompson, aged 20, from Australia. 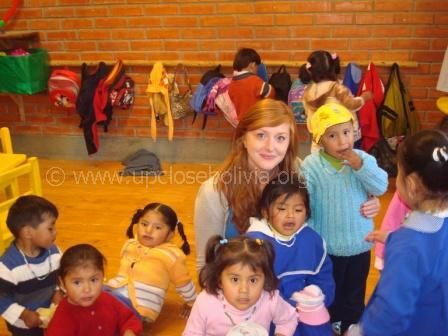 Rachel and Noah have both been volunteers at Valley of the Moon Children’s Centre, La Paz, Bolivia. This organisation is a locally-run community centre for children of 6 months to 4 years providing classroom and nursery class support in a traditional Andean setting. The aim is to provide childcare for the families of the surrounding areas such as Juapapina and Mallasa, primarily to allow the mothers of the area to gain employment. Volunteers (many of whom were on a gap year or extended backpacking trip), have been helping out at Valley of the Moon Children’s Centre for many years. The safety of the children at the nursery is paramount and for this reason all volunteers must complete an application form and supply references. This procedure is done via Up Close Bolivia. Were any special skills required for this volunteer position? Rachel: Basic conversational Spanish, a love of children and a CV and references to be sent to project organiser, Emma Donlan. Noah: Intermediate Spanish was a definite [plus], although I had very little Spanish to begin with it soon improved. Definitely good communication skills, open-mindedness and a love of working with children. R: I have previously worked as a Physiotherapist, and decided upon a career change into teaching, specifically working with children aged 4 to 8. When planning my trip to South and Central America, I decided to include some volunteer work, to help give something back to the local communities I would be travelling through, and enhance my classroom experience to assist in my new career. N: I had been travelling in South America for a while and thought I should help somewhere, I had worked in schools and with children in Australia in the past so that seemed like a logical starting point. R: I knew I wanted to preferably work and volunteer in an Andean, Indigenous setting and preferably in a large city. Bolivia and La Paz therefore suited the bill perfectly. N: I had been to Bolivia before on my trip and being the poorest I had seen in South America I thought my skills and time could be best used there. I also met two volunteers from the nursery in Argentina that told me about the organisation and I decided to apply. Had you done much volunteering previously? R: I have worked with nursery aged children with learning difficulties and volunteered in mainstream urban based primary school settings previously. After completing my placement at Valley of the Moon I also completed a similar placement in Cusco, Peru, working with school aged children in an after school club capacity. What were you hoping to gain by volunteering? R: I was hoping to gain experience working with children in educational settings. Hoping to confirm my career change and decide upon Primary school teaching as a career. Also to have a unique experience living with a host family in an unfamiliar setting, and improving my Spanish. N: Certainly to improve my Spanish but also to give something back and learn about a country and its people. How did you hear about the organisation? N: From two other international volunteers. Did you do any background research on the organisation before arranging your placement? R: I visited the website and was in constant contact with Emma, the project co-ordinator, how was really informative about the project, placement and living arrangements. 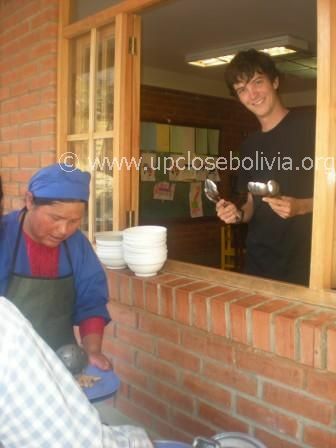 N: I emailed the coordinator, Emma Donlan, who gave me the website of Up Close Bolivia. Did you arrange the placement yourself or was it done through an intermediary or agency? R: I arranged it myself by contacting Emma [of Up Close Bolivia] directly, though the contact details were initially supplied by ‘Volunteer Latin America’ (all volunteers at the Children’s centre are required to apply via Up Close Bolivia to ensure that the application and references procedures are followed). Were you required to pay a fee and if so, how much? R: The cost was 400 dollars per month, which included placement fees and accommodation with Emma and her family. (The fee will vary depending on how long you intend to stay, how much pre-placement support you need, whether you are able to organise your own accommodation and whether you have any specific skills in this area. In general the daily cost would be less than staying in a tourist hostel in La Paz. Please contact Up Close Bolivia to determine how much the cost might be in your case). R: The organisation, specifically Emma, welcomed me into her family home for one month. It was wonderful, with a private double room, access to bathroom and kitchen facilities and some meals included. I paid 35 Bolivianos per day for meals on other occasions. I assume there was a profit to the scheme, which went towards support and maintenance of the nursery facility itself. What other costs should a volunteer budget for? R: Local daily transport was, on average, well under 1 pound per day on local buses and collectivos. Food and snacks could have come to around 5 per day, more if eating out in a restaurant. Very cheap and affordable. N: Food, mainly during weekends, dinnertimes or additional snacks. Local transport certainly. Were you provided with adequate training to do your role? R: Yes. I was given a full briefing by Emma and the Head Tia [“tia” is auntie in Spanish] of the school on the first day. Then continued support, explanation and assistance throughout my placement. Much appreciated. N: I was shown the ropes as I worked and spent time at the nursery, although I already had experience working with children. Describe a typical day as a volunteer. How many days did you volunteer in the week? R: I worked from 8am until 4pm almost every day Monday to Friday for 4 weeks. A typical day included helping serve and feed, depending on the age group, the children breakfast, lunch and snacks. Supporting in their learning time, assisting with bathing and hygiene routines. I also completed dance, sport and music sessions with small groups of children on a daily basis, to support their creative learning. N: I volunteered 4 days a week but there was always the option to do more. A typical day would involve helping the children in the morning, then some activities involving either drawing or something more hands on such as assembling puzzles. A morning tea would generally be eaten outside and playtime would follow. More indoor activities would follow, singing and dancing with the children is a day to day occurrence. Lunchtime would involve encouraging the children to eat again followed by a trip to the bathroom to ensure everyone was clean and did their business. How did you spend your time off? R: With the family, attending social events, parties, concerts, school plays etc. Also went into La Paz centre for shopping, meeting friends and tourist attractions. N: Exploring La Paz, occasionally travelling to other areas of Bolivia with friends and once I spent a day working with one of the members of my host family’s flower farm. What about the other volunteers who were there at the same time as you? R: There was a group of 4 other volunteers who stayed for around 3 days the first week I was there, which was really great. They were English and Swedish and I am still in touch with them via Facebook. N: There were two other volunteers who were working at the same time as me, two English girls who I spent a lot of time with and became good friends with. The relations between us were good, us all being around the same age. How were you received by the full-time permanent staff of the organisation? R: They welcomed me with open arms and seemed really grateful for the small amount of time I was able to assist and work with the children. On my final day I was also presented with a series of handmade thank you cards and a leaving party, which was hugely touching. N: Initially they were very reserved and shy around me, probably because I was the first male to have worked there with the children. It didn’t take long before they became their normal selves, chatting and laughing away. In addition to this I was always thanked for my help each day and when it came to leaving for good there were many tears and goodbye gifts. In the advertisement you read, was the nature of the volunteering accurately and honestly described? R: Absolutely accurate and honest in the description of the role I would be providing, the living arrangements and what to expect. Emma was also able to answer any additional questions I had via email before arriving. Did you feel that you were doing something useful? R: Absolutely. The full time staff members were incredibly busy looking after a large group of small children, and an additional pair of hands and different ideas brought to the organisation, hopefully helped to enhance the children’s learning and experience at the school. N: Some days were harder than others and I felt as if my time could be better spent doing other work but I have come to the conclusion through all my experiences that even small actions and help can make a difference or at least contribute toward one. How long did you volunteer for with this organisation? Was this more or less than you imagined at the start? R: I requested to volunteer for 4 weeks and completed the full 4 weeks. N: For two months, which was a month longer than I thought I would. What have you learned and/ or gained from this experience? R: Loads. I have confirmed that I 100% want to work with children in an educational setting. I have learnt how charming, challenging, funny and intelligent children from all backgrounds and cultures can be and that the Bolivian and Andean people are some of the most friendly and welcoming I have met. A fantastic experience all round. N: More of an appreciation for Bolivia and its people, who are amazingly dedicated, knowledgeable and politically aware. What did other volunteers think about their experience? R: Though only there for a short time, I think they learnt a lot about the traditional Bolivian and Andean way of life, as well as enjoyment of their time working with the charming children in the school setting. N: The other volunteers I worked with regarded it as some of the best times of their life. Knowing what you do now, is there anything you would do differently? R: I would maybe try to learn some basic school based Spanish phrases before coming, as the first few days proved a little frustrating with the language barrier. Otherwise the only thing I would do differently would be to spend longer at the school and with Emma and her family. N: I would try and do more with my host family, probably work more days with them on their flower farm. What was your favourite thing about the volunteering? R: Working with bright, interesting and funny children of varying age groups on a daily basis. Improving my Spanish by gaining experience and knowledge from the full time staff and feeling a part of my new extended Bolivian family with the Donlan Medozas. N: Playing with the children. N: Trying to get them to eat. Do you have a particular memory from your volunteering that you could share with us? R: Apart from all the memorable and funny things that happened at the school with the children and staff, the memories I will take away with me will be how welcomed I was made to feel within Emma’s home, invited to several social occasions including the royal wedding at the ambassador’s house. In terms of the school, the leaving party and the cards I received as a thank you upon leaving will also remain a special memory and one I will never forget. Are there any changes that could be made to improve volunteer experiences? R: Only from myself to potentially learn slightly more Spanish before arriving to help with the first few days of the placement. N: Not that I can see. Would you recommend this placement to other potential volunteers? Do you have any advice or information would you like to pass on to anyone considering going to Bolivia to volunteer? R: Definitely do some research into the specific area of Bolivia you are looking to work in and then take things sloooowly at altitude when you arrive. N: Go where your skills can be best used. Any other information you feel is relevant? R: Being in contact with Emma before arriving is important to answer any questions you may have as well as arranging specifics in terms of accommodation etc.